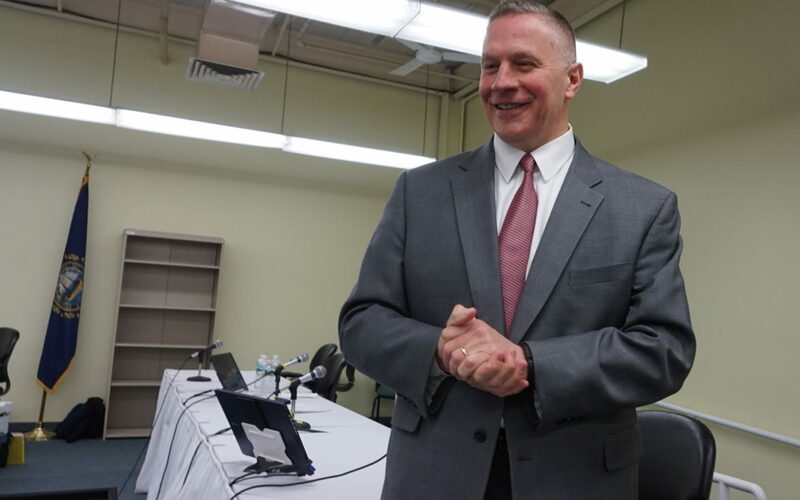 William Quinlan, president of Eversource New Hampshire, is pictured after testifying at the adjudicative hearings in Concord in April 2017. Subscribe to our free Friday weekly news updates, Sunday weekender features and breaking news alerts here. 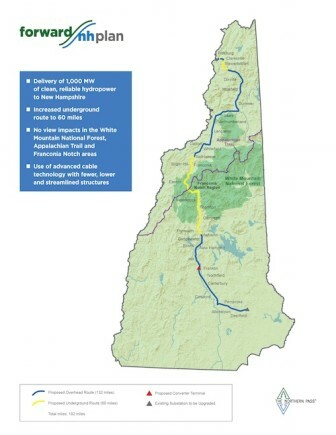 CONCORD — Massachusetts electric distributors decided Tuesday night to end negotiations with Northern Pass Transmission and turn solely to Central Maine Power to deliver Hydro-Quebec electricity to the Bay State for its clean energy project. The decision, however, does not mean Eversource is abandoning the 192-mile, $1.6 billion, 1,090 megawatt transmission line from Pittsburg to Deerfield. The company said it understands the decision by the electric distribution companies including its Massachusetts Eversource affiliate to terminate negotiations given the delays in the New Hampshire permitting process. The state Site Evaluation Committee on Feb. 1 voted 7-0 to deny Northern Pass’ application saying the project would interfere with the orderly development of the region, impacting businesses, tourism and home values. “Despite recent delays, we continue to believe that Northern Pass is the best project for the region and New Hampshire, and we intend to pursue all options for making it a reality,” according to the Eversource statement. Project developers and intervenors are waiting for the Site Evaluation Committee to issue its written decision by the end of this month. Eversource will have 30 days to ask for reconsideration and if that is turned down has said it will likely appeal the decision to the state Supreme Court. Opponents of the project say with the Massachusetts decision it is time for Eversource to face reality and drop the project that has been opposed by most communities, residents, businesses, environmentalists and municipal officials along the route. Susan Schibanoff of Easton has opposed the project since its inception and said it is time to listen to the opposition as Massachusetts has done. The project is not without its supporters including labor unions whose members would work on the project, business groups including the Business and Industry Association and the Greater Manchester Chamber of Commerce that seek lower electric rates, as well as small business owners particularly in the North Country who would benefit during construction. Of the project’s 31 host communities, only Franklin and Berlin supported the project, and Berlin’s support was conditioned on how money from the the Forward New Hampshire economic development fund and the North Country Job Creation Fund would be distributed. Business and Industry Association spokesman Kevin Flynn said the association is reviewing the situation. “Eversource and Hydro-Québec remain committed to the success of the project. No other project has obtained the necessary approvals from federal permitting authorities in the U.S. and Canada, and secured agreements with major contractors and the IBEW,” Eversource said in its statement. The project has obtained all of its United States and Canadian permits, with three exceptions: the SEC, the U.S. Forest Service Special Use Permit, and the U.S. Army Corps Section 404 Permit. “It is because of these achievements that Northern Pass was originally selected as the top bid in the Massachusetts Clean Energy solicitation,” according to the Eversource statement. The Society for the Protection of New Hampshire Forests opposed the project saying it should be buried along the I-93 corridor instead of along state and town roads in the North Country. Originally Massachusetts energy officials named Northern Pass as the only one of 46 bidders to begin negotiations with the distributors, but within a week, the New Hampshire Site Evaluation Committee denied Northern Pass’s application. After that decision, the Massachusetts clean energy bid selection committee decided to continue with Northern Pass, but to also negotiate with Central Maine Power, whose plans also include transporting 1,200 megawatts of Hydro-Quebec electricity to Massachusetts to help meets its clean energy goal established in law two years ago. One of the three major distribution companies in Massachusetts is Eversource. The others are National Grid, which submitted its own proposal for the Massachusetts Clean Energy Project, and Unitil. Hrdro-Quebec said it will continue negotiations to provide the power for the Massachusetts project with Central Maine Power. After the Site Evaluation Committee rejected Northern Pass’s application, company official asked the SEC to vacate its decision denying the application and to resume project deliberations. Once the written decision is issued, Northern Pass will have 30 days to ask the SEC to reconsider its decision. Members of the Site Evaluation Committee question Robert Varney, on the right, about the proposed Northern Pass Transmission Project’s effect on the orderly development along its 192-mile route from Pittsburg to Deerfield on Sept. 26, 2017. Members of the SEC pictured are: public member Patricia Weathersby, SEC legal counsel Michael Iacopino, SEC chair Martin Honigberg, SEC vice chair Kathryn Bailey, Department of Environmental Services representative Craig Wright, Department of Transportation representative William Oldenberg, and SEC administrator Pamela Monroe. Not pictured is public member Rachel E. Dandeneau. As of Dec. 31, Eversource had spent $277 million on Northern Pass including $2 million for the Counsel for the Public and its experts, more than $1 million to the Department of Environmental Services for permit fees and $600,000 to the Site Evaluation Committee in applications fees, according to Northern Pass spokesman Martin Murray. The negotiated contracts between Central Maine Power and the Massachusetts distributions utilities — if it is successful — will be presented April 25 to the Massachusetts Department of Public Utilities for final approval. The Central Maine Power project is currently before regulators in Maine. The New England Power Generators Association recently asked to intervene in the project. A decision on the Maine proposal is expected in September.